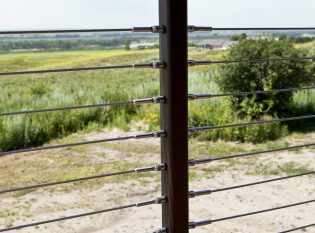 Material and Finish: "Oil-Rubbed Bronze" powder-coated steel posts with aluminum top rail. The new National Lewis and Clark interpretive center was designed by UBL Design Group. 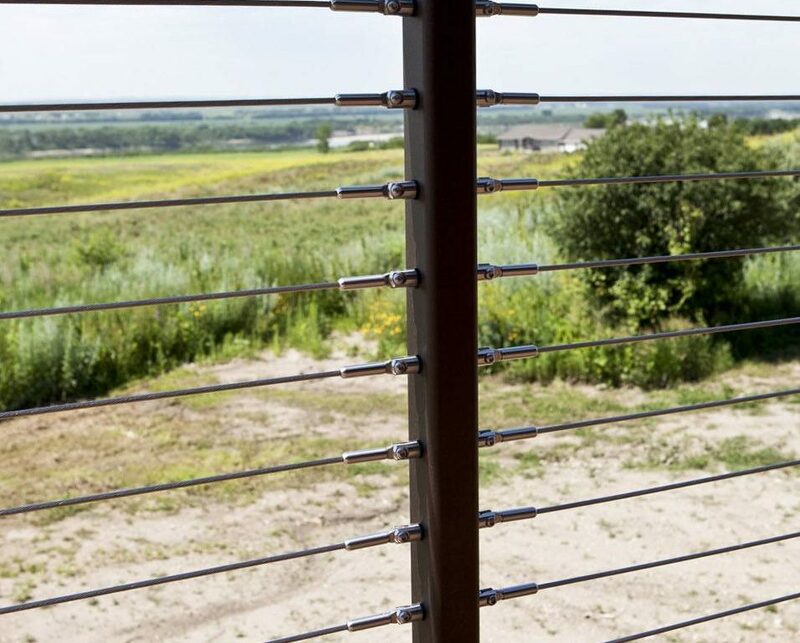 For the rear observation deck, the architects wanted to showcase the expansive views of the Missouri River and therefore chose our Ithaca Style cable railing with the “Oil-Rubbed Bronze” powder coat and a matching aluminum top rail for a clear and unobstructed sight line. The observation deck provides ample space for events allows the visitors to enjoy the expansive wide open views. This is a beautifully built facility that incorporates the use of stone, metal and wood and composite decking for a rustic yet low maintenance deck. Cables were 3/16″ diameter 1×19, type 316 stainless steel. Adjust-a-body turnbuckles were used to keep everything tight. Custom metal graspable handrails were designed to be ADA compliant and attach to the stone wall and the staircase. As part of our process we create renderings for the architects, builders and stakeholders to review and approve before beginning to fabricate the product. In doing this we can work out the details to accommodate any special requests and it helps to ensure everyone is on the same page.